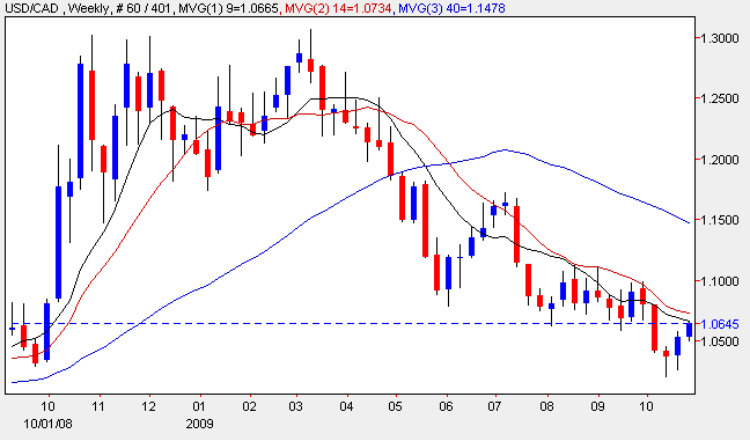 As it is the start of another currency trading week for the usd to cad, I thought it might be more useful to look at the weekly chart for the pair, as this analysis is perhaps more revealing than the usual daily chart, and indeed we do have some interesting developments for the poor old usd vs cad. The first positive point to note is that the small hammer candle of two weeks ago has now been confirmed by last week’s trading action, with the weekly chart ending with a narrow spread up candle, which although far from suggesting a strong rally, would indicate a degree of bullish sentiment in the market, and perhaps a minor reversal higher, possibly to re-test resistance in the 1.06 price region in due course. Secondly the low of last week and the previous week, seemed to find some support from the strong platform below in the 1.02 price region, and on both occasions bounced from here to move higher. All of this ‘positive’ news is of course counterbalanced by the negative sentiment evident in the weekly chart, with all three moving averages pressing heavily downwards, and with deep levels of resistance above. So in summary, we may see a short squeeze higher on the weekly chart in the short term, but probably with insufficient momentum to sustain a longer term rally for the usd to cad pair, which still look set to breach parity in due course. There are no items of fundamental news on the economic calendar for either Canada or the US save a speech from BOC Gov Mark Carney on the topic of financial regulation. You can keep up to date with all the latest fundamental news on the economic calendar, latest currency news and live currency charts by simply following the links. I have also included details on an excellent ECN broker.